Puget Sound conditions are normalizing after seven months of lower oxygen. Calm, dry, cool, and foggy mornings abruptly changed on October 28 to sun and strong northerly winds. Red-brown blooms and abundant jellyfish in south Puget Sound inlets appeared as we flew to the coast. Blooms were still visible near ocean beaches and inner bays. Grays Harbor had abundant surface debris with green algae in North Bay. We spotted red-brown blooms in rivers and sloughs in Willapa Bay, as well as schooling fish near sandbanks. Many patches of suspended sediment appeared in shallow water unrelated to tidal currents and remain unexplained. 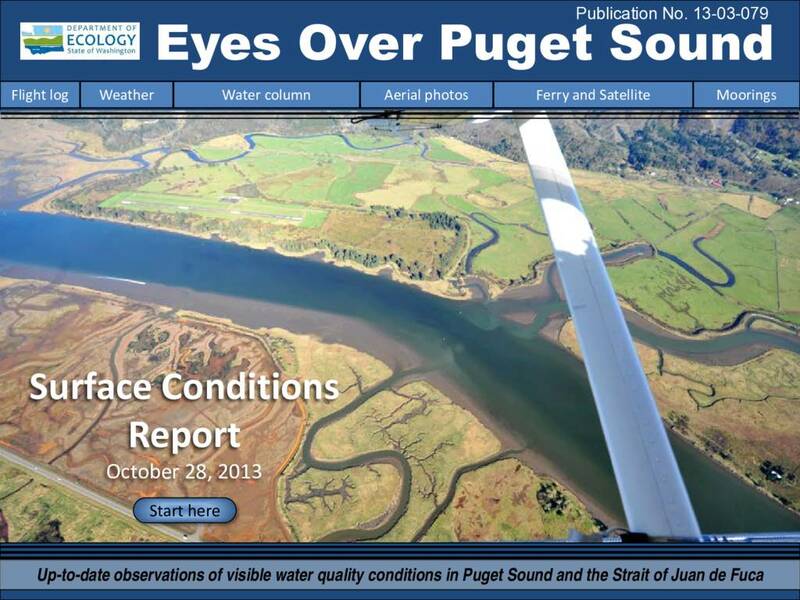 Description Puget Sound conditions are normalizing after seven months of lower oxygen. Calm, dry, cool, and foggy mornings abruptly changed on October 28 to sun and strong northerly winds. Red-brown blooms and abundant jellyfish in south Puget Sound inlets appeared as we flew to the coast. Blooms were still visible near ocean beaches and inner bays. Grays Harbor had abundant surface debris with green algae in North Bay. We spotted red-brown blooms in rivers and sloughs in Willapa Bay, as well as schooling fish near sandbanks. Many patches of suspended sediment appeared in shallow water unrelated to tidal currents and remain unexplained.